The primary and secondary colors are customizable. This worked for me. If when I started this blog, you had asked me if I had a "perspective preference" when it comes to RPGs, I would have said no. I would have pointed out that there are excellent games in just about all perspectives. Even Neverwinter Nights' (2002) Aurora engine, which tried to have it all ways, has its advantages. My only bias is an irrational disdain for players who play games clearly meant for first-person views in the optional third-person, "over the shoulder" perspective. Judging by YouTube videos, that's a decent majority. I don't want to imagine how such people were raised. But over the last year or so, as more and more Ultima clones have aspired to epic status, I've developed a new opinion: if you use a top-down perspective, you damned well better offer a complete set of game maps or an in-game automap, or limit your indoor maps to something small, like 36 tiles squared. Otherwise, I hate you a little. It's virtually impossible to map a top-down game. There are too many tiles to do it on graph paper in a reasonable amount of time, and if you just try to hand draw it, you end up with a mess. Good games like Ultima IV and Ultima V understood this. Thus, they provided a "frame" for the large outdoor areas in the form of the cloth map, which the player could use as a reference and make his own annotations. For the indoor maps, they kept to 36 x 36, ensuring that a player couldn't get lost while exploring a castle or town. It worked fine. A small top-down continent doesn't need to be mapped. A large top-down continent can't efficiently be mapped. But in the late 1980s, we're seeing a whole slew of games like Deathlord and Nippon that want to use a top-down perspective but want to use the improvements in storage media to make their areas enormous, ensuring that the player either continually misses key areas and NPCs or has to play for dozens of hours petrified that he has. Nippon thankfully offers in-game maps for each town and makes finding them a kind-of sub-quest. Deathlord and now Ranadinn offer no such considerations. 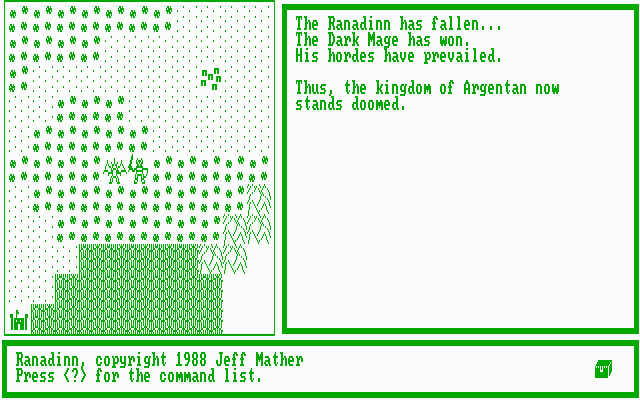 Ranadinn is an Ultima III/IV-inspired shareware game from Jeff Mather (then) of Tucson, Arizona. We saw his work previously with Silmar (1991). Ranadinn has some innovations but lacks the polish of commercial titles, and it starts with an insane difficulty level, include one game-breaking omission. The backstory is unoriginal but at least competently told. The character is a polymath--fighter, cleric, and magician--raised and trained by a mysterious ex-king named Osnenemus. ("Ranadinn" is the character's name for his "class," a portmanteau of "ranger" and "paladin." In-game, everyone calls him "battlemage.") Once a mercenary, the character has fallen on hard times because the land is at peace. He thus eagerly accepts a commission to investigate the emergence of a threat to the four islands that make up the kingdom of Aregentan, ruled by King Gregory. It seems that some wizard from the east has gotten hold of the Hand of Mordanneus, an ancient necromancer who channeled his life force and power into his hand before he died. With the hand, the sorcerer is leveling cities and raising an army of monsters. He has put his essence into a black crown and scepter, has broken the crown, and has distributed its pieces to his various lieutenants. There is no character creation--not even a name. Every character starts at Level 3 with 400 experience, 21 hit points, 200 gold, 20 food, 5 torches, and 13 points each in six attributes: strength, intelligence, wisdom, endurance, coordination, and personality. Gems that you find in the dungeons can raise individual attributes. I'm guessing that the row of icons at the top of the screen, which starts with the middle one selected, changes depending on what skills you favor during the course of the game. You start outside Gregory's castle with no armor or weapons. Commands are limited; aside from the arrow keys to move, you only have (C)hange screen color, (I)gnite torch, (R)anged attack, (U)se possession, and (Q)uit. You talk to NPCs, open doors, and attack with melee weapons by just bashing into those things. ENTER serves as an all purpose "read," "get," and "open" for whatever you happen to be standing on. Your equipment is limited to swords, bows, and plate mail, the manual's excuse for this being that you weren't taught anything else. Even after you have armor, ranged attacks--which you aim with a targeting cursor--are essential to avoid losing too many hit points too fast. Anything else is "unusable." Couldn't I at least take them to sell them? 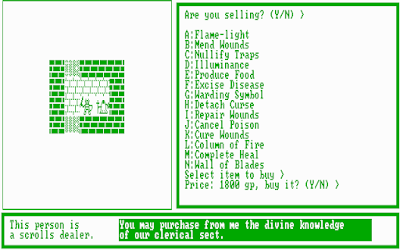 Spells have to be purchased individually in the form of scrolls. 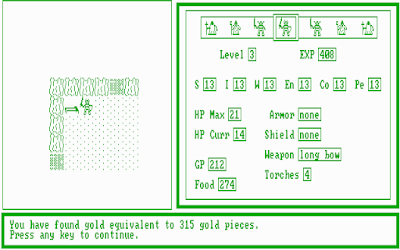 Perhaps later in the game, you have so much gold that the cost becomes trivial, but at the beginning these scrolls are prohibitively expensive even though some of them--"Nullify Traps," "Flame Light," "Cancel Poison," "Unlock"--are effectively necessary. These spells are way out of my reach. The indoor areas feature swarms of NPCs, but unlike the Ultima games, they're unnamed and mostly useless, imparting only platitudes instead of authentic hints or bits of lore. "Good day, sir! "; "I wish you well on your journey, sir! "; "I welcome you, Battlemage. May you win your battles for our little kingdom." There are a lot of facilities within the town--e.g., inns, pubs, stables--that are labeled but not functional: there's no way to rent a room or buy a drink or horse. The game's difficulty becomes apparent quickly. 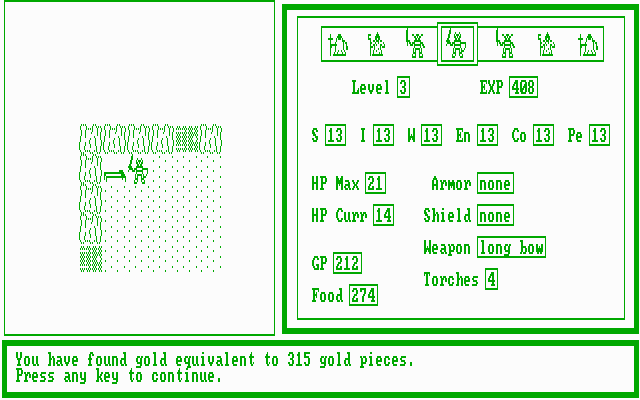 The cheapest armor costs 400 gold pieces, and the only reliable source of gold is inside dungeons, where an armorless character dies within three or four hits of the lowliest enemy. Explore too long in the outdoors, meanwhile, and you eventually run into enemies capable of flinging poison from afar, or undead enemies capable of damaging the character's maximum hit points, rather than just his current hit points. Wandering through this dungeon without armor is asking for trouble, but I need the loot. As for your own hit points, they regenerate at the sluggish pace of 1 every 50 moves. You really need spells to do any serious healing, but again you're almost always under-funded. Poison is essentially a death sentence because scrolls to cure it are enormously expensive and rarely found. The worst part is that you start the game with only 5 torches, and none of the shops in any town seem to sell torches! (At least, I can't find any. In an e-mail conversation I had with him, Jeff insists they exist, but at least agrees they're not in the towns near the game's beginning.) Once the 5 are gone, your only recourse is to purchase "Flame Light" spells, but you don't find nearly enough gold to keep up with the cost of that spell. There are a few strengths to the game. 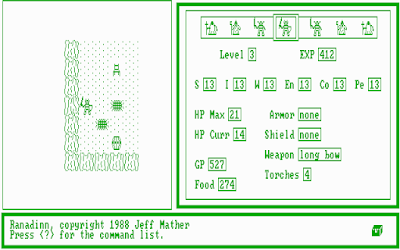 First, combat occurs by targeting cursor, which enables ranged attacks and doesn't force the player to artificially target an enemy in his column or row. 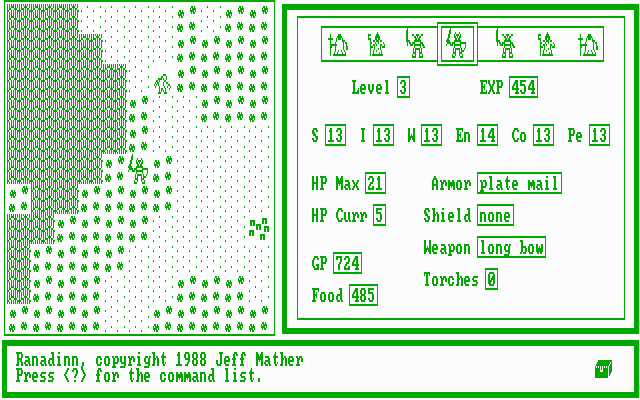 Ultima V would do the same, but Mather wouldn't have known that when designing this game. Given the preciousness of hit points, ranged attacks become a vital part of combat tactics. 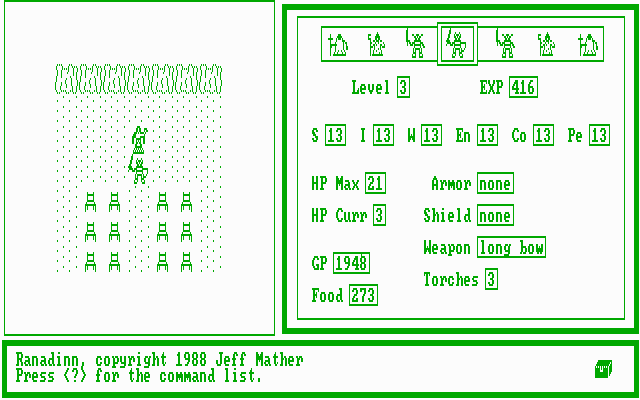 Second, Mather does a good job using the limited icons to set up little scenarios throughout his towns and dungeons. There are clear dining rooms, worship areas, and so forth. The denizens of this dungeon clearly worship this statue. 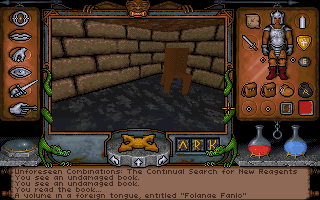 He also copies from Ultima IV the use of minute differences in wall textures to denote secret doors. There's one right next to me. I started and restarted the game several times. My best character reached Level 3 (you get a new level with every 200 experience points, but enemies offer only a few per kill), but eventually I played to a standstill. I ran out of torches, cannot afford any more spells, and instant-death foes face me whenever I wander too far in the outer game world. I could hex-edit myself some more torches, but I wanted to get the developer's perspective, so I wrote to Jeff at his workplace, a company that makes custom software applications. 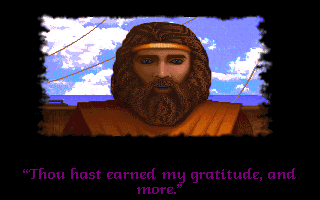 He was aghast that I was trying to play Ranadinn 30 years later and apologized for what he felt were numerous bugs, but I motivated him to download DOSBox and re-investigate it himself. After a few days, he wrote back that he's working on a rewrite, hoping to fix bugs and playability issues. "Who knows when I'll finish," he says, "but the end product (if I do finish) will certainly be superior." If he'd demonstrated the surprising enthusiasm of Rüdiger and Thorsten (cf. Nippon), I might have stuck with it. As it is, especially given Jeff's own comments, I think I'll let it go . . . for a few games. Ranadinn was re-released in 1989 under a slightly different title (only one n at the end) and with a different graphic set. In about 20 games, I'll see how the remake differs and whether it's worth playing to the end. I guess I needn't have worried. The inventory error message didn't manifest itself in any obvious way, and I was able to get to the end of the game. I was in a constant state of agitation until then, however, which hurt my enjoyment of the last level. I spent most of Level 8 obsessively collecting every bone and skull that I could find, then taking them back to Level 5 and trying to use them on Garamon's grave. The grave stopped accepting them with the previous "you thoughtfully give the bones a final resting place" message, and I started to worry that I'd somehow filled up the grave. Eventually, I found a refuse heap worthy of a mage: Vas, Tym, Sanct, and In runes, a case with a scroll of "Freeze Time," a Ring of Invisibility, and a set of bones. Those, fortunately, turned out to be Garamon's. When I used them on the grave, his spirit appeared. Garamon suggested that we open a gate to send the Slasher back to his own world, which would require a lot of magical energy. He said that the source should be "pure" and somehow tied to the traditions of Britannia. Then he left it to me to suggest the solution: the various TALISMANS of virtue that I'd been assembling for the entire game. I didn't have a saved game recently; otherwise, I would have tried the first option. While agreeing on the source, he was stumped on "a latent source of power" to "release their stored virtue." Again, I had to feed him the keyword. It wasn't hard; it was all around us: LAVA. He agreed and said I should toss the talismans in the lava when I encountered the Slasher. I shall name a font after thee. The last major step before the endgame was assembling the "three-part key." I'd already found the Key of Courage on an upper level. The Key of Truth came from telling the seer Illomo that I'd rescued Gurstang, which involved giving him a keyword--FALANAE--that Gurstang had spoken to me. Illomo said that the key was in another dimension, but I could call it back at an ankh shrine with the right mantra--a mantra that might be found in a library book. Exploring the library, I found a book called Falanae Fanlo, used the second word as a mantra at the shrine, and got the key. It's a good thing those are the only two words I could read. This otherwise might have taken a while. I knew beyond a doubt that the Key of Love would come from Judy, once I gave her a picture of Tom, but I couldn't find the damned thing for the life of me. I finally had to look up a hint. I'm glad I did, because it was a bit unfair. One of Tyball's prisoners who you free on Level 7 is named Bolinard, and he asks if he can help you by making a map of the area. When I first met him and he asked that, I chose the answer that said, "No, I know my way around" because by then, I'd already explored the whole level and the automap was filled in. It turns out that you have to say "yes" so that he writes the map on the back of the picture of Tom. In any event, I took the picture back up to Judy on Level 5. She mercifully had not fallen into the lava in the meantime. When she saw the picture, she cried a single tear, which fell into the lava and somehow turned into a Key of Love. Well, I feel like a jerk now. 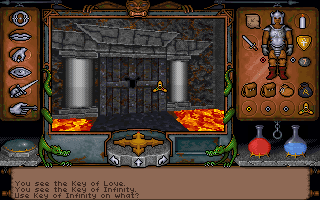 With the three-part key, I could open the inner chamber of the volcanic core on Level 8. I had discovered it ages ago. 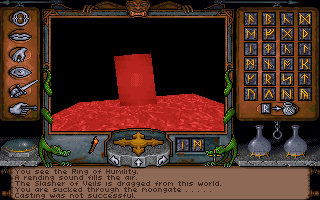 Hey, is this supposed to be the same chamber that had the Codex in Ultima IV? The Slasher of Veils was standing in a square of lava within, trapped by some magical energy. He won't talk to you, which I thought was too bad. Attacking him causes his bonds to break, and he kills you instantly. I half-expected him to be a gargoyle. With no other options, I threw each of the eight talismans into the lava, watching them burst into flames one by one. The moment the last one hit, a portal opened and sucked the Slasher into another dimension, and me along with him. It's nice that in this chaotic hell-dimension, someone took the time to paint the floor tiles. We were in a chaotic todash space, void on all sides, weird images like giant eyes and laughing mouths in the periphery. The Slasher was there, and he immediately started for me, so I had to run. There were several paths leading from the central area. My first choice, a red path, ended up leading me to a moongate that simply warped me back to the beginning. Demon dogs are just a few of the horrors in the periphery of the final area. My second choice, a green path, wound about for what seemed like miles, some horrible image at every bend, my health draining for no reason throughout the journey. Eventually, I came to a moongate and burst through. This was apparently the right one, for the endgame sequence commenced. The moongate apparently brought me to the shores of the Isle of the Avatar, because the endgame narration (all text, no voices this time) explained that I dove into the sea with the lava at my heels. Fortunately, a ship belonging to Baron Almric was sailing nearby. What happened to my boots? The "and more" part is never really elaborated. Have there been any others? The ship sailed away as the volcano engulfed the Isle of the Avatar behind us. Remember this next time you hear someone say, "Why don't we just throw all our trash into volcanoes?" The final text explained how, after I got home, Garamon came to me in a dream, thanked me, and said he had used the last of his magic power to open a portal for the rest of the inhabitants of the Abyss. "They are now settling in a place called Destard," he said. 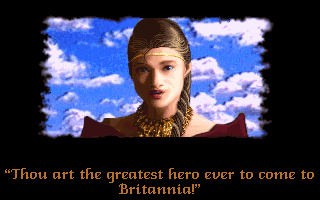 I'm sure that I'll find their descendants there in Ultima VII and this will not simply be never referenced again. From your lips to Lord British's ears. After a final farewell, I got the screen at the top and a summary of my endgame status. As usual, while appreciating the detail of the narrative, I feel that Origin missed some opportunities. First of all, rather than some demon we've never head of from a place we've never heard of, why not make this the first appearance of a villain who's about to have a big role in the Ultima series? You don't even have to refer to him by name. Just, you know, some being from another dimension has contacted Tyball and wants his help getting through. It would add more to the twist in the next game. 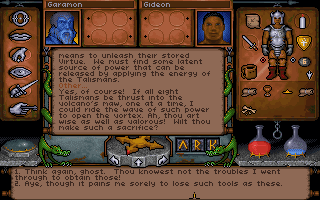 Second, just tossing the talismans of virtue into the lava is a boring way to treat them. Why not create a quest that makes more thematic use of the objects? It would have been fun if, for instance, the player had to identify the best individuals to wield each object among the game's NPCs. The backstory is mostly wasted, but of course it's largely a framing story for a game that was originally conceived as an independent title. We don't really hear that much about Cabirus or why the colony fell apart, and the history is unnecessary to understanding present events. Wouldn't it have been more interesting if Cabirus had summoned the demon to purge the place after seeing his experiment fail? 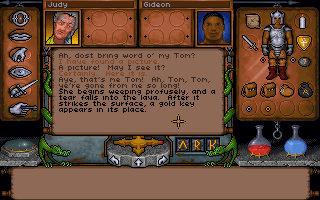 Adding insult to injury, I don't think we ever hear of the events in Ultima Underworld again. Neither Arial nor Almric nor their descendants pop up in a later game. We never hear about the Slasher of Veils. In Ultima VII, the Isle of the Avatar doesn't seem particularly worse for the volcanic apocalypse presented here, and despite my joke above, I don't think there are any signs of civilization in Destard. 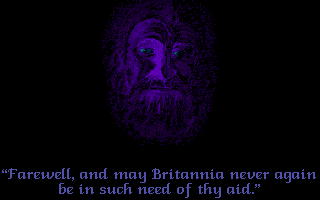 I'm pretty sure multiple characters in Ultima VII refer to "the last time" the Avatar visited, clearly referring to Ultima VI. Correct me if I'm wrong. But let's make sure we include a Wing Commander reference in this game. That's important. The story got really lazy at the end. How did the moongate happen to take the Avatar to the outdoor area of the island, right where Almric's ship happened to be? Why couldn't the Slasher follow the Avatar through the moongate? How did the Avatar even get home from this trip? After offering a pretty lame way to get him to Britannia--he came through a dream--the developers don't bother to send him home at all. Before I close, I want to say a word about the nature of the combat system in Ultima Underworld and similar games in which combat is integrated with the main game engine, and not offered on a separate "combat screen." 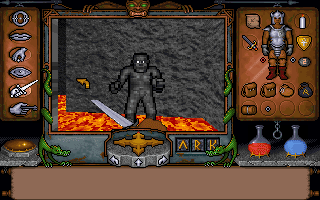 On the surface, tactical combat seems to take a step backwards in Ultima Underworld. 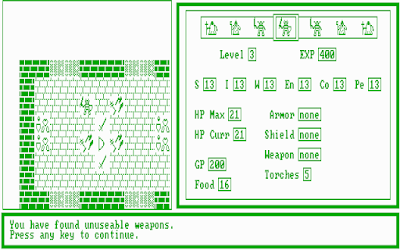 Previous Ultimas, which of course featured multiple characters, allowed for careful, turn-based combat on a tactical grid, with options to target various enemies with both melee and missile weapons, cast spells, and use items. 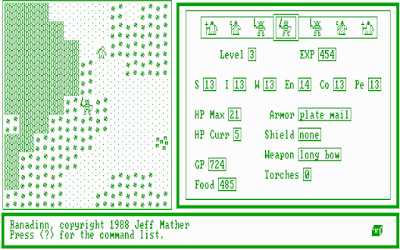 Ultima VI allowed you to assign a "template" for offense or defense to each character. In each game after III, terrain was an important tactical consideration. Leave the Ultima series and you find even more tactics in the best games of the day. Consider the system of stealth, backstabs, and opportunity attacks in the Gold Box series, the "foresight" system of Knights of Legend, and the buffs and resistances of any D&D-based game. 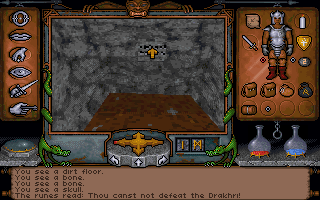 In Ultima Underworld, we're reduced to a single character swinging repeatedly at foes while stringing together the occasional spell. 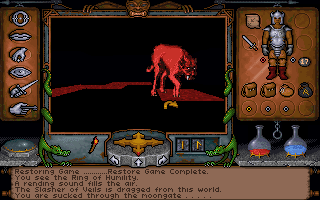 But something deeper is happening, because in Ultima Underworld, "combat" isn't a separate and unique phase of gameplay. 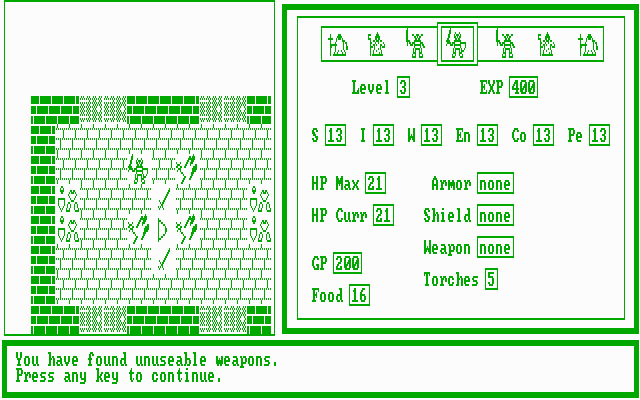 Rather, a weapon or spell attack against an enemy is simply one of many options you can perform in the main interface. Hence, we need a new approach to thinking about "tactics" in such a game. I would submit that for a game in which combat is integrated with the main game engine, nearly anything possible in that engine is a part of "combat tactics." This is far from the first game with an integrated interface. Ultima I and II had one. But the mechanics of those games even outside of combat were so limited that the integration didn't provide many additional tactics. Things start to improve in Dungeon Master and its descendants, also featuring integrated interfaces, with options to smash enemies in closing doors and try to get pits to open beneath them. 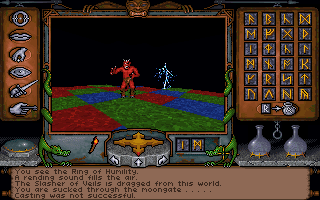 Ultima VI was the first real "sandbox" game, but few of the related options improved the characters' chances in combat. Use my superior jumping ability to reach a higher platform where the enemy can't hit me. Lead the enemy into a room, flee, and shut and spike the door behind me. Shove an enemy off a platform or bridge and into lava. Delay an enemy by pelting him with random objects scooped up from the dungeon floor. Hide in shadows and simply sneak past enemies. The last time I played the game, I played on "legendary" difficulty, and it was exhilarating finding ways to defeat foes I could never have defeated just standing there swinging away. Between various stealth options, leading enemies to each other, spells and powers like "Calm" and "Frenzy," leading bandit chiefs up the sides of mountains so I could FUS-RO-DAH them back down, making daring escapes by jumping into rivers, sniping dragons from behind cover, conjuring allies to occupy enemies while I found a new place to hide, trapping Dwemer spheres behind grates, luring enemies into their own traps, and a thousand similar scenarios, I felt the game offered just about all I needed for combat tactics. I think if the next Elder Scrolls changes nothing [except adding body-part specific damage], it will be one of the best real-time combat systems ever made. 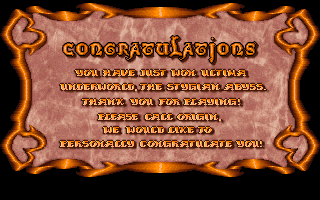 The problem with Ultima Underworld is that it doesn't have a "legendary" setting, so the combats are too easy to win without resorting to any of the tactics that it offers. But the engine is ready for them. That's something else we can add to the game's admirable legacy. The PC arrives home at last. 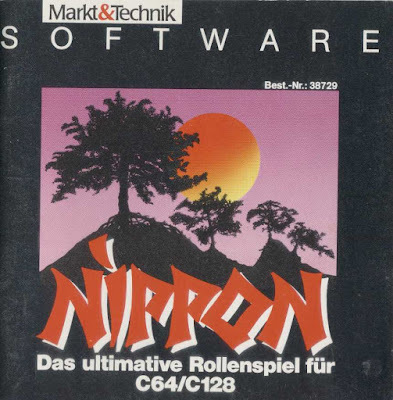 Since my first entry on Nippon, we seem to have reached consensus that the "final version" of the story presented at the Nippon Museum web site is the one that the players of 1988 read. It's worth reviewing that backstory as we contemplate the end of the game. It concerns an overworked, directionless Tokyo professional named Toshiro who becomes fascinated by the account of a fantasy world called Nippon that he finds in a local bookstore. The account is written by a man named Shimo from the modern world who suddenly finds himself in this faraway place. Taken in by a kind man named Kamisori, the protagonist at first denies the reality of what he's experiencing, but then comes to accept it as he travels the land and fights monsters. The account describes a bit about the land's history and geography as well as some of the items and skills the player may find in the game. Unable to find his way home, Shimo writes a book about his adventures and tosses it into the abyss at the edge of the world, musing that "maybe these words are to be found once in the old bookstore, which stood in a side street of Tokyo, in which everything began." While speaking to one of Nippon's residents, Shimo tells him of statues of a king and queen that he saw at a Tokyo museum. His companion recognizes the descriptions as Emperor Tenno Subarashii and his princess, Kikori Shiramoto. The princess was miserable and disappeared a few hundred years ago. Toshiro, reading the account, is excited to see the statues for himself. He heads down to the museum, walks between a couple of columns, and wakes up next to a river in Nippon. The implication is of course that Shimo is actually Toshiro and that he was reading his own account of his visit. If I'd realized that the other stories presented on the site didn't have much of an impact on the game, I wouldn't have been quite as confused as to its plot. The earlier ones put much more emphasis on the emperor and princess and their doomed marriage, with the implication that the princess somehow made her way to the real world and instigated Toshiro's trip. As he stands looking at the statues in Version 1, for instance, an old woman, whose eyes look like the princess's, grabs his arm and says: "You have to go back, you must! Start again, find it! You were so close, and everything is coming back! Find it, and then I too am free!" Spine-tingling words, and a great way to begin a story. Version 2 mostly tells a longer version of Version 1; Version 3 somewhat unites 1/2 with the "final version," making it clear for the first time that Nippon is another land and not just ancient Japan. But in the final text, the emperor and princess are de-emphasized, and no old woman appears when Toshiro begins his journey. The story is more focused on the cyclical and pre-determinate nature of Toshiro's experience. Thus, the main goal of Nippon is simply to return back to Tokyo. 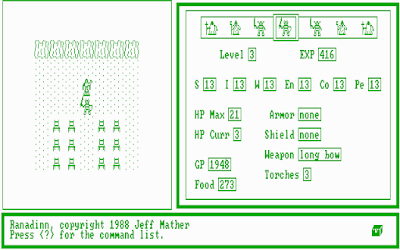 To do so, the player first has to accumulate the weapons, armor, items, and skills necessary to survive and navigate in a hostile world. 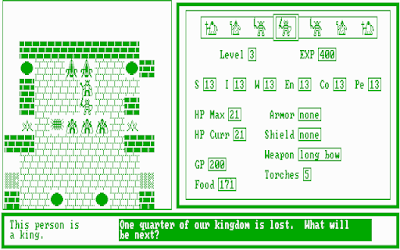 He then has to travel the enormous landscape (at 1024 x 640, the largest we've seen by 1988), visit the towns and castles, and collect the clues necessary to find his way home. Chief among them are the key dates at which the six mountains of "Nippon" can be consecrated. He must use the Wheel of Time to visit the mountains on those dates, then pray at a couple of temples to find his way out. The final portal won't let him leave if he hasn't visited all the Buddhas and (I think) achieved the combat rank of "shogun." Most of the spells and items are superfluous. It turned out that in addition to the "magic" skill, I also needed a spellbook in which to record the spells I found. But even once I found the book, I didn't bother to collect all the spells. There are 10 of them, and all of them are helpful but not wholly necessary. For instance, there's one that promises to blow past the dialogue "stances" and force an NPC to reveal what he or she knows--but at the expense of scaring away all the other NPCs in the area. There's one that allows you to warp out of cities without finding the exit. There's a "heal" spell; I got the most use out of that. None of the combat or defense spells are really helpful since combat is so trivially easy. The only required spell is "Tsuranuku," which lets you walk through walls, and is (I think) necessary for the final Buddha. The German word for "spellbook" is awesome. Similarly, the skills are hit and miss. "Swim" is absolutely essential, but I never found any particular uses for "Hide" or "Infravision," the latter of which lets you see enemies through walls. "Infravision" is duplicated in utility by the Stone of Toshi. Neither is terribly necessary, but they help a little when trying to find nearby NPCs. This is a cool bit of programming, but it has limited utility. The most valuable item turned out to be the Amulet of Hi, which I found in a lava pool near Fujokawa. It allows you to walk through lava without taking damage. This is not only necessary in a couple of places but extremely useful in others, so you don't have to watch your step so carefully. The Ring of Igaku, which protects against disease from the swamps, was also extremely helpful. I have to admit: hiding the amulet that protects against lava in lava was diabolical. I don't want to think about how my character "searched" for it. Other items are mostly optional. I found the Pearl of Ki, an object over which wars were fought in the game's backstory. When used, it eliminates any creature on the screen, including NPCs in towns. 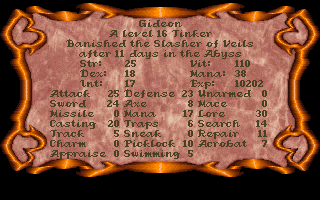 But you don't get any experience for the kills and, as I've pointed out, enemies are pretty easy anyway. I ddin't get any use out of it. The big revelation that allowed me to get to the endgame was, of course, that the magic globe was a teleportation device. The 10 syllables represented Japanese numbers from 0 to 9. You string four syllables together on two lines, the top line representing the X coordinate, from 0000 to 0640, and the bottom representing the Y coordinate, from 0000 to 1024. (All valid X coordinates and all but a few valid Y coordinates begin with Rei, or 0.) 0000,0000 is at the top-left of the map. You can use the Mirror of Earth to check your current coordinates at any time and the globe to teleport--up to three times per day. Getting ready to teleport from a small island. Using the device while in a boat can cause some issues. You all laughed when I said I was using ArcGIS to annotate the map, but this allowed me to create a planar coordinate system and automatically calculate the coordinates of every city I'd already found. To visit a non-city location, I just had to hover my cursor over that part of the map to see the coordinates. Once you have the globe, you no longer have to worry about ships or any other mode of transportation; you can just warp to any point on the map. The only annoyance is that it takes a while to scroll through the eight syllables and set them, and enemies can appear and attack you while you're in the middle of it. Again, I cursed the developers for not just letting me use the damned number keys. Automatically calculating the X and Y coordinates of each town in ArcGIS. Such an artifact made the flying horse superfluous, particularly since you have to use the globe to get to the horse in the first place. I found the pegasus in the middle of a mountain enclave on the north end of the center continent. Riding the horse is pretty cool, since you can see the entire landscape with no obstructions, but you can't do anything else while the horse is in flight, including responding to enemy attacks. Any use of the button causes the horse to try to land in its present location. The horse actually needs a landing strip of about 7 grassy squares to land safely. If he has less, he stops short and is injured, and you can't fly him again until you visit a horse doctor in one of the towns. Flying over a hidden mountain area that seems custom-made for landing a flying horse. Still, I used the horse for a while because when the globe told me it was out of energy, I didn't realize until later that it only meant for the day. I can also see where the horse would have been useful to a player not cheating by using a pixel-perfect map and a $5,000 GIS system, since it would be hard to land in a precise location with the paper map. This is not the sort of place you want to get this message. You use the Wheel of Time to make the journey, but the trick is that you have to be young or old enough to survive. You can't travel 150 years at a time. Starting was no problem, since I was only about 30, and the trip from 742 to 777 would only age me to 65. But to go back from there to the next date, 31 Boar 682, I had to be about 110 years old so that I could survive a trip 95 years in the past. Setting the Wheel of Time. Thank god for the globe. If I'd had to sail to the Wheel and then to all the mountains, I would have gone crazy. Instead, I settled into an easy pattern: warp to a town where the physician offered an "aging" service and pay until I was old enough to survive, warp to the Wheel of Time, set it, then warp to the associated mountain to meditate and "consecrate" it. Six times in a row and I was done. I was never clear why I could only do this on specific dates. I probably missed a key NPC somewhere. Going back in time by more than 230 years didn't affect anything else. My flying horse and ships were just where I left them, the NPCs were still all alive and in place, and none of the lava receded. Thus, the whole thing was a bit silly. If Thorsten and Rüdiger want to re-make the game, I'd suggest that a series of quests that tie into the backstory and lore of the land would serve better. They had some interesting stuff about the emperor, princess, and wars between the gods that never amounted to anything but flavor. Once I consecrated the mountains, I had to visit two temples that had offered nothing on previous visits. The first one told me to go to the south, on the border of the void, and search for a shrine at the end of the labyrinth. Well, of course I didn't bother to go through the labyrinth. I just used the globe to go directly to the shrine. Visiting it caused a nearby bridge, which had previously ended in a blank wall, to extend. I wandered on a narrow path through the void--touching the walls brought instant death--until I arrived in the final city, Mokuteki. Navigating the hidden path through the void. 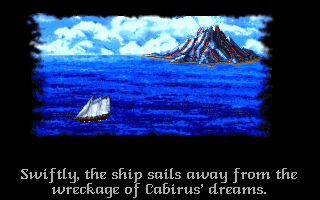 Mokuteki started by requiring me to swim a gap, then walk through a large lava pool, then hop in a ship to get around. If "Swim" and the Amulet of Hi weren't necessary before, they sure were here. The rest of the area was a bit obnoxious. I had to thread the boat through a long water maze in which touching the walls was instant death. In an era where I would have had to reload the entire game from scratch, I might have paid for a ticket to Germany just so I could have egged the developers' houses. For some reason, I had to buy a jin-no-dachi (a kind of magic sword) for 7,000 from a guy on an island. Fortunately, I had enough. I then had to give the weapon to a statue right next to the guy who sold it. This opened a hidden passage to the exit. Outside was a small, mountain-enclosed lake with a skull in the center of an island. The first time I visited the skull, it told me that I had the "will but not the skill." Apparently, I hadn't visited all the Buddhas in the game, which is a prerequisite for leaving. I had to abandon the ship, warp back to the cities I'd missed, and answer a few final riddles. One of the Buddhas was in Mokuteki itself, behind an impenetrable wall, so I cast the "walk through wall" spell to get to him. I think this is the only necessary spell use in the game. When I returned to the skull again, the endgame commenced. It switched to a side-view and depicted me emerging from the other side of the skull, a ship standing nearby. 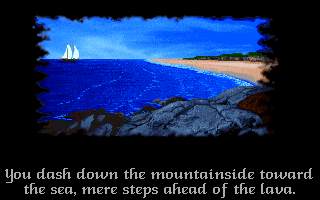 "You traverse the tunnel in the interior of the skull and reach the other shore," the game said. I wonder if my slaves are still with me. I sailed the ship left until I made landfall in the same city where the game started. I sailed past a lighthouse and industrial wharf, docked, and walked past several buildings. Eventually, I made my way back to the museum where the game started. With nothing else to do, I walked through the pillars. "The circle closes," the text read. "The statues pull you into a world that you already know." And then it brought me to a "new game" screen. Toshiro is trapped in an endless loop. I guess that's supposed to be profound, but it strikes me as a little lazy. 5 points for the game world. The setting is original and the story is full of lore, but the player doesn't really engage with it, and nothing changes in the setting during gameplay, not even when you travel hundreds of years through time. The physical layout of the towns and continents are well-designed. 2 point for character creation and development. A very under-developed area. There's no creation at all, and combat is only rewarded with a titular rank. Your attributes increase by visiting Buddhas and demonstrating your knowledge of lore, but after a few of these visits, you really don't need any more (except as a requirement to win). Weapon skill increases are more useful, but you only get three per class of weapon. 4 points for NPC interaction. Perhaps the most important part of the game, hindered by a "stance" system that to a 1988 player would be like banging your head against a wall. 1 point for encounters and foes. The enemies in the game are completely un-interesting. They're not even much of a challenge. 2 points for magic and combat. Combat is like swatting at gnats around your head. You barely have to worry about it except that some enemies won't leave you alone. There are some interesting spells in the magic system, but it takes too long to acquire them, and as we've seen, they're mostly superfluous. Using the only necessary spell to get me to the final Buddha. 3 points for equipment. One weapon, one suit of armor, but there are some interesting artifact items. 4 points for economy. 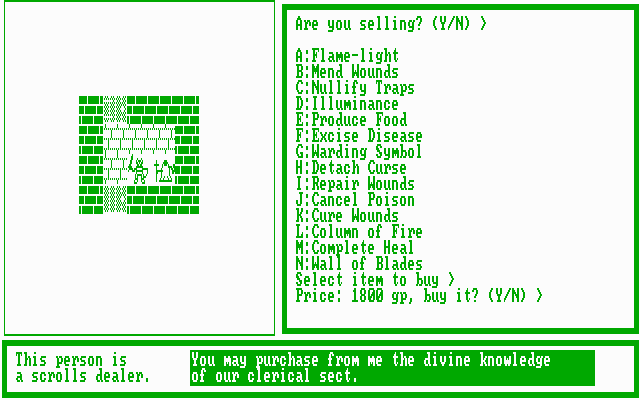 It's ruined a bit by the treasure chambers, where you can keep visiting to collect as much as you want. Eliminating those (or making them single-visit), boosting combat rewards, and lowering some costs would have created a more challenging system. There are quite a few things to buy with your money, though, and I thought the slaves, bath houses, and prostitutes were fun twists. 3 points for a main quest and some side-areas. "Get home" by itself is rarely a great quest. At least Dorothy made Oz a better place first. 3 points for serviceable graphics and sound, but as for the joystick-only interface: AAAAAAAAAAAAAA! 5 points for gameplay. The open world and nonlinearity are of course the strong parts of the game. Its difficulty is moderate enough, and it stands just short of the cusp of being too long. That give us a final score of 32, just shy of what I would normally call "recommended," mostly for its lack of traditional RPG mechanics. A good RPG has to be more than going from city to city talking to people. Interesting things have to happen in between. But there is a definite allure to the open-world exploration, to finding that new city nestled in some remote valley, knowing it will be full of NPCs who fill in even more of the story. Of course, I had to painstakingly translate all those NPCs, reducing my own enjoyment significantly, but I tried not to let that affect my score. The game uses all memory on a C64. The one review that I found in the October 1988 Power Play gives a pretty poor score--basically 36/100 if you average the categories. The reviewer praises the story and setting, offers amazement at the size (four disks! 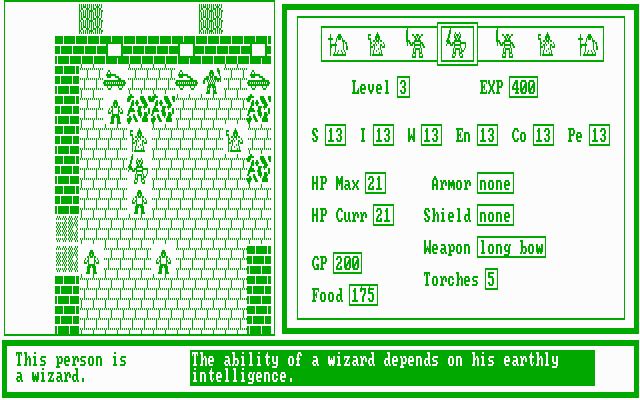 ), and is happy to have an RPG in German. But he feels it is weak on graphics and sound and is particularly irked that enemies can still attack you while you're standing there waiting for the disk to transition you from wilderness to town. It frankly doesn't feel like he got very far into the game. He gets some facts wrong on the backstory, too. It's funny seeing him refer to Ultima--the oldest game only seven years old--as a "classic." Rüdiger (left) and Thorsten (right) at 23 and 21. 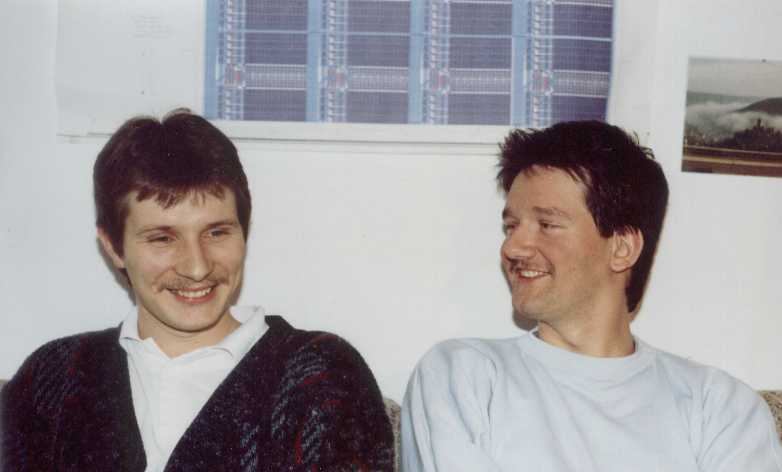 Thorsten Shur (now Sommermann) and Rüdiger Hoppe were friends as teenagers, and like many teenagers of the 1980s, they fell in love with Ultima II and Ultima III. 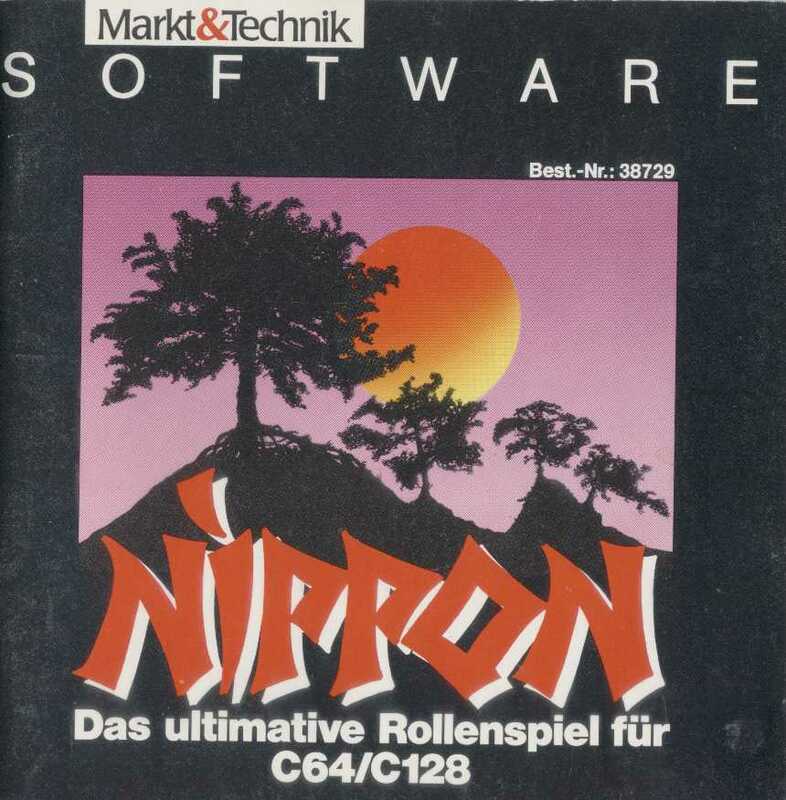 They decided to try their own game, with updated technology, fusing an Ultima approach with their enthusiasm for the Bushido tabletop RPG setting, from which they took the character ranks and the name Nippon. I skimmed through the rulebook for Bushido, and it doesn't appear that Thorsten and Rüdiger adapted much else directly. Maybe some of the skills, weapons, monsters, and gods. The maps and location names are wholly original to the game. This guy doesn't look like he's doing so well. The size of the game pushed the limits of the Commodore 64. I noted in a previous entry that the city of Ulti-Tori is shaped like Sosaria from Ultima III, but what I don't think I made clear is that it's also the same size as Sosaria; the entirety of Ultima III's outer world fit into one of Nippon's 40 cities. The game used all available 64kb of memory. 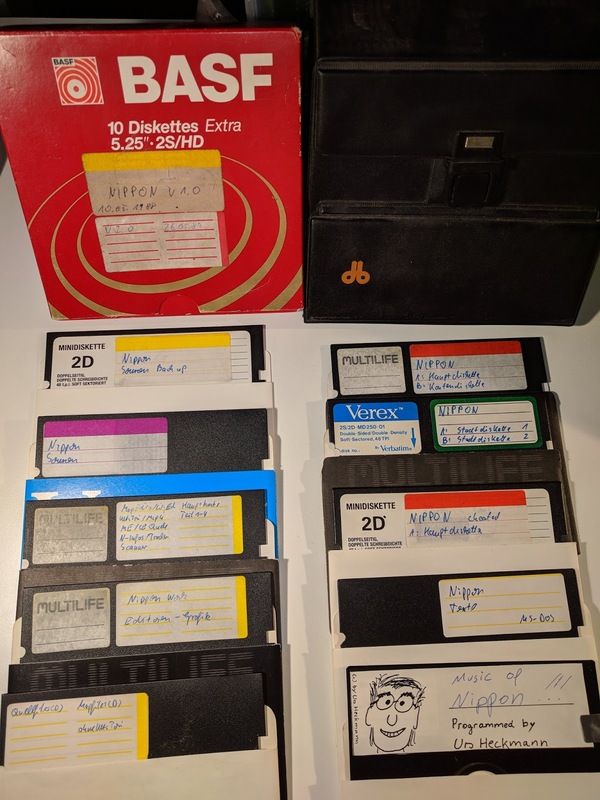 To make such a large outer world possible, the disks are not organized into files but read block-by-block, which can cause some amusing errors if you put the wrong disk in the drive while traveling. The authors found a publisher in Markt & Technik. The title song was written by Urs Heckman, who went on to form a company that makes software synthesizers. The game retailed for DM 40 (about $47 in USD today). Unfortunately, the company did little to promote the title and offered no support for translation or porting to other platforms. Rüdiger's best recollection is that it sold about 7000 copies. This series of entries prompted Rüdiger to dig the old disks out of storage. The game was written in assembly code and assembled with a program written by the developers' friend. The bug I mentioned above frustrated a lot of players, apparently, and many of them wrote to the developers, who had included their addresses among the NPC dialogues in Funatabi. The authors made a version 2.0 that fixed the problem, but it wasn't published. It's probable that those who took the time to write were the only ones who won the game until the modern era. Thorsten and Rüdiger both entered the information technology field but never worked on another game. They keep in touch and occasionally talk about reviving Nippon on another platform, or creating another Japanese RPG in a 3D environment. This is the sort of game that I wouldn't mind seeing re-made. Keep the same large, open-world approach, exotic setting, and interesting backstory and lore, but improve the combat tactics, character development, and inventory systems; offer a more complex interface; and better integrate the story with the quest. Maybe introduce some elements of caste and karma prevalent in Bushido that didn't make it into Nippon. I want to thank the developers for visiting and corresponding with me, and Buck and Sebastian for helping me along. I started off thinking I wasn't going to finish this one and ending up glad that I did. We'll see if the same is true of the next 1988 offering: Ranadinn. 1. I'm dismissing the upcoming The Scheme (1988) as a non-RPG. I'm not sure what "RPG elements" the various web sites that so categorized it think it has, but I watched a long video on the game and I don't see any. It's a side-scrolling action platformer. 2. Rogue Clone turns out to be so suited to its name that I don't even know if it's worth playing it as a separate title. Even if I do, it apparently dates from 1986, not 1988 as MobyGames has it, so it'll have to go on the "sweep up" list.